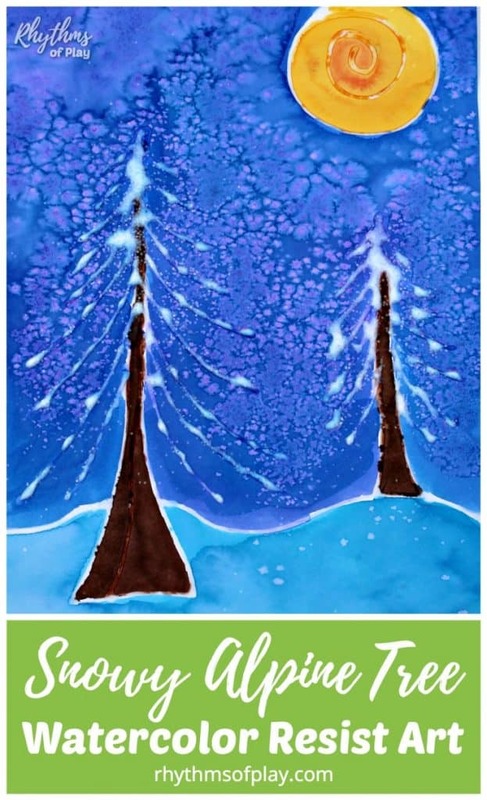 Alpine tree watercolor resist art is an art project for kids and adults of all ages. My daughter and I had fun painting winter landscapes together on a chilly afternoon. We completely messed them up and they still look gorgeous. Yes, even you can do this! Draw a winter landscape with alpine trees on watercolor paper using a resist medium of choice. If using glue, allow it to dry completely before painting. Click HERE to learn more about resist mediums. Put watercolor paint in baby food jars. Dilute with water. Test color on scrap paper for vibrancy adding more water or paint as needed. Place water in a canning jar and a flat watercolor brush on a rag. Paint over glue for a neat textured effect. Sprinkle salt onto painting before it dries to create a droplet effect. This alpine tree watercolor resist art project did not turn out as I had expected. I used white glue to quickly draw two alpine tree drawings on watercolor paper. One for my daughter to paint, and one for me to paint. Art is not just for the little ones… Feel free to join in on the fun! Once they were completely dry, I invited my 3-year-old daughter paint her’s first. To my surprise, the glue did not resist! The glue soaked up the color so the alpine trees did not stay snowy white like I thought they would. See photos below. I decided to paint around the glue on mine to see what would happen. Most of it stayed white while some of the glue got colored when the watercolor pooled near it. After we completed the project we decided to do an experiment to find out what watercolor resist medium would work better for projects like this. See Art & Science: Experiment with Watercolor Resist to find out what we discovered! 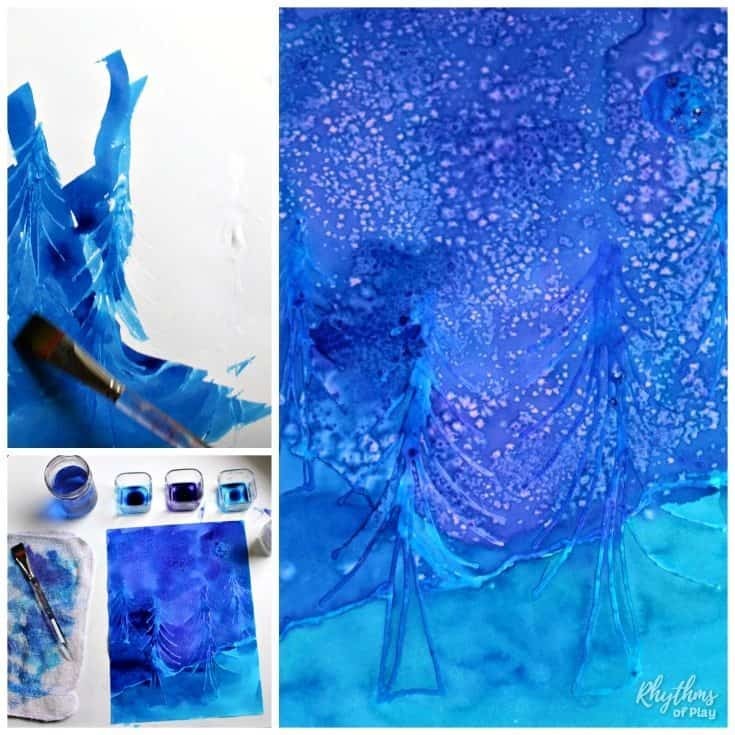 This project is an easy STEAM rainy or snowy day activity for kids. Artists of all ages will enjoy learning how to paint with watercolors using a resist medium. 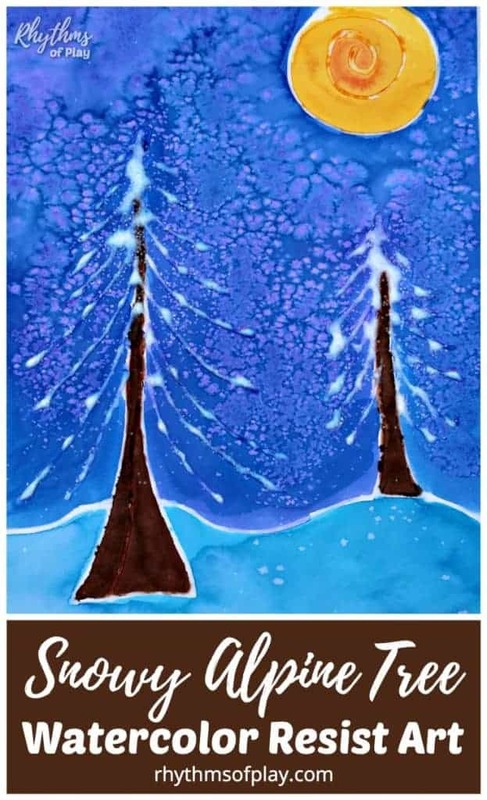 Painting a winter alpine tree landscape is a fun way for kids to learn about and connect with nature during the colder winter months. Don’t forget to check out this awesome collection of winter art projects and our winter bucket list!